It may not give you Eddie’s fingers, but the EVH 5150 LBXII will certainly give you some of his key sounds, and at this price, that’s really good value for money. May still be too gained-up for some. It may be hard to believe, but it’s the 40th anniversary of Van Halen’s eponymous debut album next year - the one that made Eddie Van Halen a superstar practically overnight. Today, Van Halen is not only known for his epic guitar style, but also the equipment he uses. Currently managed by Fender, the EVH gear brand includes a range of guitars and amps, from the big 100-watters used by the man himself, down to an affordable lunchbox-style head that has just benefitted from a revamp. 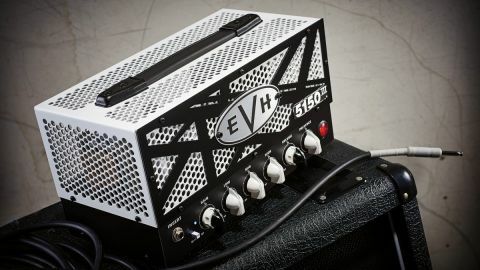 Here we’re looking at the new version: the 15-watt EVH 5150III LBXII head. This Mk II version of EVH’s LBX looks similar, but it has a few significant differences. The white control panel is now black, while the preamp offers a choice of the clean (green) or crunch (blue) channels from the 5150 100-watt head. The controls have been expanded with separate gain and volume knobs on dual-concentric pots, greatly improving flexibility compared with the Mk I version. There’s a shared set of bass, mid, treble and presence controls, with a global resonance control for tweaking the all-important bottom-end response. Other rear-panel features include a series effects loop, a single loudspeaker jack with switchable impedance, a socket for the supplied single-button footswitch, and a toggle to flip from full power to 1/4 power. Underneath the bottom cover, the 5150 LBX II’s electronics are mostly held on one large through-plated PCB that holds all the front panel controls and valve bases, while the rear panel switches are chassis mounted and connected with spade terminals. It’s designed and built to last. The LBXII may not have its predecessor’s red channel and it has one less preamp valve, but there’s no shortage of overdrive from the blue crunch channel. Even using a Strat fitted with standard low-ish output single coils, the gain and distortion borders on the cheerfully insane: harmonic squeals fly off the pick and the LBXII’s medium-fast attack is excellent for modern rock and metal chop rhythm patterns. Overall, the LBXII’s core ‘Plexi’-inspired tone has a very modern USA vibe: it’s perfect for modern rock and most metal sub-genres, and you can tune it to perfection using the presence and resonance controls. While it may be small, the LBXII packs a serious punch. Not only is it crammed with great rock tone, there’s plenty of volume, too – more than enough to cover small to medium gigs, even on the quarter power setting. This revamped, revitalised version of EVH’s LBX head has a lot going for it: it’s built to a decently high standard and has much-improved flexibility without sacrificing anything in the way of tone. You can go from snappy cleans through to mild blues overdrive on the green channel, or switch to the blue channel for all the gain and filth you’ll ever need.